Wild rice is precious, even ceremonial, in some Native American cultures. It’s not a grain and not really rice. It’s the seed from a grass growing in or near the edge of a lake or stream. Mature wild rice is gently knocked from the mother plants, rather than the entire plant being cut and threshed as is wheat, or white rice. Wild rice is farmed in California and still traditionally harvested wild in Canada and the northern Great Lakes region. 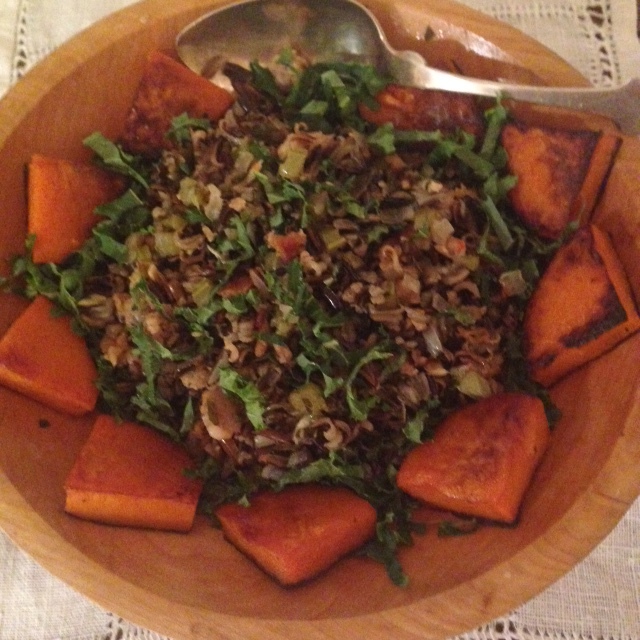 Good wild rice is expensive, not something for every day, but perfect for Thanksgiving. When we consider foods to include in our all-American feast, we look to our original, seasonal produce; wild rice belongs right up there with pumpkin and cranberries. Wild rice should have firm, even grains and should not smell dusty. It should be shiny and dark. It takes a long time to cook and needs care. I can’t remember when I first started using wild rice with my Thanksgiving turkey, but I do recall the woman who taught me to wash, soak and slowly cook the grain until it swelled, split, and curled, completely tender. She was eating a bowl of warm wild rice with sugar and milk for breakfast. Whether you call it dressing and cook it in a casserole alongside your turkey or use the wild rice mixture to stuff your turkey, it may turn out to be the tastiest part of your dinner. I think stuffing is the way to go since turkey juices enhance the rice, but a buttered and covered casserole of it will give a great side. It’s whole grain, Midwestern, and native to the America we celebrate on Thanksgiving. The night before, rinse and soak wild rice covered in cool water. The next morning, drain and simmer rice in 4 cups fresh water for 30-45 minutes or until the rice is split open, curled and tender. Drain rice in sieve, shake away excess water, return to saucepan, and sprinkle with salt. Meanwhile, sauté sausage, breaking it apart into crumbles; remove from frying pan. Slice and sauté mushrooms. Set aside. In the same frying pan heat the oil and sweat the chopped onion and sliced celery (cover with butter wrappers). When the onion is tender, add garlic, chili, herbs, and cook until fragrant. Combine the aromatic vegetables with the drained rice and/or sausage/mushrooms. Combine and taste for seasonings, adding more salt and pepper as needed. Cool the mixture thoroughly if using to stuff your turkey, or scoop into a buttered casserole dish with a tight fitting cover. Bake in a moderate oven for an hour or inside the turkey for the duration of the roast. Makes 6 cups; serves 8—best leftovers! You are currently browsing the Mary Jo's Kitchen blog archives for November, 2015.